This pack combines the Industrial Revolution Pack and the Upgrade Pack. 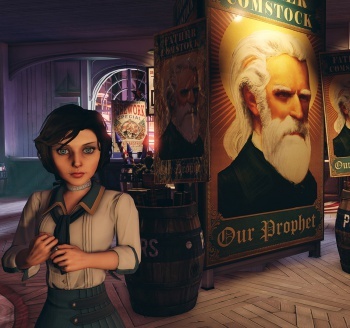 Steam has released the Columbia's Finest DLC pack for BioShock Infinite, a combination of the perks first seen in the Industrial Revolution Pack and Upgrade Pack first seen in the Premium and Ultimate Songbird editions of the game. New weapons, new Gear, lock picks and cash can be yours, for $4.99. Interested parties please note: this is not part of the BioShock Infinite Season Pass content. 500 Silver Eagles and 5 Lock Picks are yours at the start of the game, to make your life a little easier. The Gear includes Handyman Nemesis (damage done to Handymen upped by 50%), Sugar Rush (after eating, move 50% faster for 3 seconds), Fleet Feet (when evading, movement speed increased), Bull Rush (melee targets knocked back), Extra! Extra! (audio logs give cash bonuses) and Betrayer (killing a Possessed enemy causes them to explode and do fire damage to nearby foes). You also get access to Comstock's China Broom and Comstock's Eagle Eye Sniper Rifle. Maybe it's time to revisit Columbia.